The web design industry is changing. What was once a time-, effort- and finance-consuming task can now be accomplished within minutes. A whole new generation of site builders has arrived to help non-tech savvy people not only minimize manual coding but reject it completely. However, not all website builders are equal. Some focus on ease of use and visual appeal sacrificing functionality, while others introduce innovative technologies but overlook usability. Here at SuperbWebsiteBuilders we avoid the ‘one-size-fits-all’ approach to recommending a website builder, since it’s practically impossible to agree upon the best platform. We do have our own Top 10 Rating that clearly reflects our preferences, but we highly recommend that you try out at least two or three site building platforms personally to examine usability, functionality and overall feel of the system. Today we’re taking a closer look at uCoz and Wix website builders which hold the first and second positions in our list respectively. Join us discovering the benefits and disadvantages of each platform to make an informed decision. Wix. This is almost an ideal option for creative people and businessmen. The system works great when it comes to creating small, visually appealing and functional websites without too many pages. These are blogs, portfolios, business websites, landing pages, promo websites as well as longreads. The system also makes it possible to create online stores. This is not complicated and looks appealing. However, you will hardly do that, if you need to sell two or three hundreds products only. This is not that convenient because of specific features of the WYSIWYG editor. If you’d like to, this is quite possible, however. uCoz seems more effective and interesting in this respect. 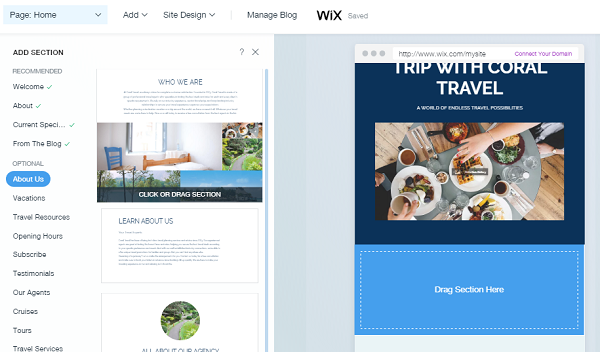 Wix will appeal to everyone, who wants to launch stunning websites that can create an impression upon users. Musicians, designers, artists and photographers will be pleased to present their creative ideas and works in the effective way by using the design options provided by the system. Businessmen will like the simplicity of the system, a rich set of tools and options as well as its functionality. uCoz. The platform is a nice choice to solve complex tasks, such as creation of large online stores, blogs, forums, new portals, websites of government institutions etc. Its power and functionality are fully revealed during the process of project creation. Of course, you can also successfully cope with promo websites, landing pages, portfolios using uKit, but there is another website builder that comes up to these needs better. This is Wix. The system makes it possible to quickly achieve effective results due to the characteristics of its editor. uCoz is very attractive for webmasters aiming at traffic monetization. This is one of the best services for SEO optimizers. The system abounds in top notch built-in tools for internal and external website optimization. The service is a great option both for newbies and web design pros. It is not too complicated to deter inexperienced users. You won’t face problems when exploring it, if necessary. Blog or forum creation, for example, is a simple process here that can be done with a few clicks only. More time is needed to set up these websites, however. If you plan a large-scale project, then uCoz is your number one choice. Wix. This top-of-the-line website builder with a visual editor can offer much more options than any other product of this class. It supports the drag-n-drop feature as well as shortcut key combinations. You can quickly switch between the elements, add them, edit, copy, delete etc. Thus, there is everything you may need when completing any task here. A separate highlight of the system is its rich app store to meet any taste. Yes, not all the applications are important and useful, but your chances to find specific functional tools that are not available in the stock Wix editor, exceed 90% here. There is everything you might need, including optimization, marketing, social networks, design, online store apps and more. Functionality tools are versatile, powerful and convenient. It’s easy and pleasant to use the system. No coding skills are required here. This benefit will appeal both to newbies and professional developers of client websites. uCoz. The system does not have any user limitations. There is everything you need to create a decent website here. uCoz is module-based and it also makes it possible to synchronize the website with lots of useful services. It’s possible to freely edit the code, but you can go without this. The result will still be worth that. The set of modules is extensive here (forum, blog, news feed, reviews, polls, video, online store etc.). You can find the required module or settings to complete your tasks. Much attention is given here to website promotion. 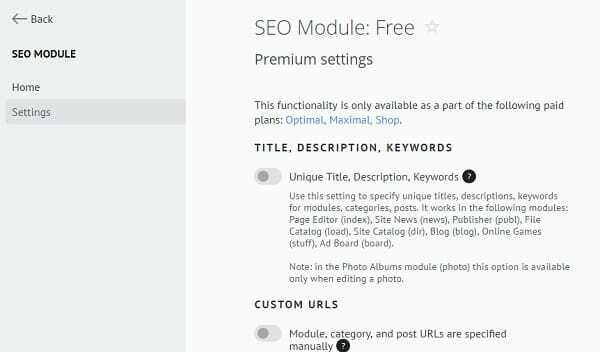 There is a separate SEO module, which will make it possible to set up promo campaigns (context, internal optimization, link purchasing etc.). Each module comes with its settings and is set up randomly: everything looks centralized, convenient and hassle-free. You can use as many functionality tools as needed. The rest can be left unactivated to simplify the work. eCommerce system options are also beneficial. There is AliExpress synchronization here and you can also set up SSL certificate in the dashboard, which has become quite important for trading platforms (user personal data security, search engine ranking effect etc.). uCoz resembles CMS more than website builders in terms of its format and opportunities provided. This is an absolutely universal system, which comes up to any needs and makes it possible to achieve any result. It is quite simple and has deep essence. Wix vs uCoz. As I see it, uCoz leaves more room for customization and growth. Wix is also rather flexible, yet it doesn’t let users change the code it generates. Wix. Much attention is given here to template quality and customization options. You can create stunning websites with lots of design elements. Templates are edited with a few clicks of a mouse. Just choose any element and drag it to get the preferred design. Wix offers lots of widgets. There are various effects, a great photo editor that makes it possible to edit photos before the publication, background video, animation and cinemagraph integration options, which can bring your website design to the brand new level. uCoz. uCoz offers many templates. They are of average quality and many of them are outdated, but this is not really a problem. There is a brand design store available in the dashboard, where you can choose an appealing thematic template for reasonable cost. You can also get it as a bonus, having purchased one of the plans. uCoz can boast powerful design customization options. You can create a project of any complexity here granted that you have specific skills. Wix vs uCoz. 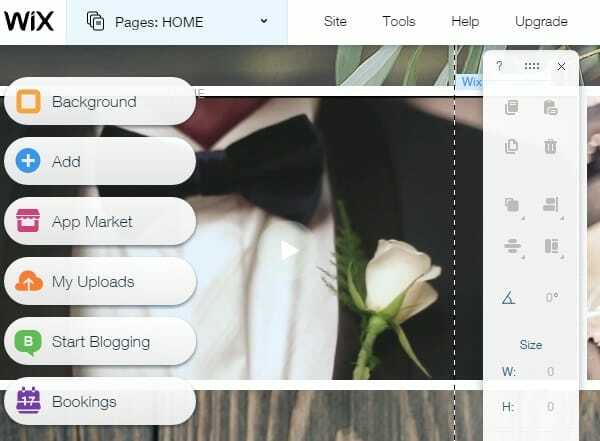 Wix’s templates are amazing, but you can’t switch them, while uCoz templates can be changed anytime. 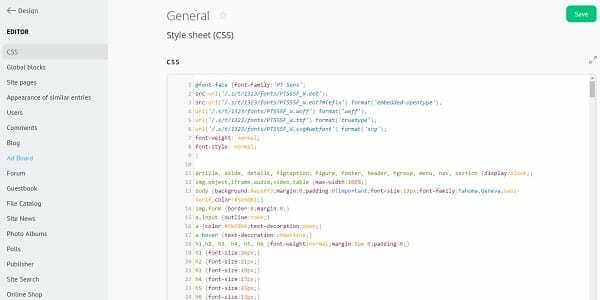 What’s more, you may even create your own, unique template and use it for your site. If you’re a pro, you may want to join the uCozTemplates project and start earning from making templates. Wix. If you face any difficulties using Wix, go to their Support Center that contains a lot of useful information: video tutorials, FAQs and other links. You may also contact their support via email. uCoz. uCoz has a strong, dynamic Community Forum where you can find support when you need it most. There’s also a detailed manual – uCoz Website Creation. For urgent cases there’s a ticketing system. Wix vs uCoz. Both platforms offer impressive learning centers containing loads of useful media to help newbies get started in a stress-free manner. Wix. The most interesting Wix plan is called “Combo”. Its cost is $99 per year and it offers a domain as a bonus. The plan works great to create blogs, promo websites, portfolios and landing pages with no restrictions at all. An online store will cost you $194 per year here. The base plan that makes it possible to connect a domain is available for $48 per year. Wix developers cut down fixed rates by offering 50% discounts. This means that you can pay twice less for a plan, which contributes to the system value with no exceptions. “Combo” itself is a bonus for $49 per year, taking into account the quality of the website builder. Discounts are offered almost every month, if not even more often. uCoz. Due to the 50% discount, which is valid for all the new system users, uCoz is one of the most beneficial website builders available in the market nowadays. Thus, you can launch a large online store for $60 per year and any other website type from a promo site to a portal for $48 per year. What’s more, you will have an opportunity to additionally select any premium template, AdSense advertising and domain. This is very generous. Generally, uCoz has one of the most interesting plans among all the website builders, because it allows connecting your own domain. A real limitation is a banner in the website corner. The rest is ok.
uCoz removes its ad banner for non-commercial organizations for free. You will get the entire functionality, except for the online store, without any money and restrictions. Just write an inquiry to the tech support to avail this benefit. Wix vs uCoz. In terms of pricing, uCoz is the clear winner. Firstly, because it allows to connect a custom domain free of charge without having to upgrade your account. Secondly, because its ad-free versions are cheaper. Both site builders are reputable, well established brands in the web publishing industry. While Wix is primarily intended for completely HTML-illiterate users, uCoz seems to encompass a broader audience, as it gives full code control.